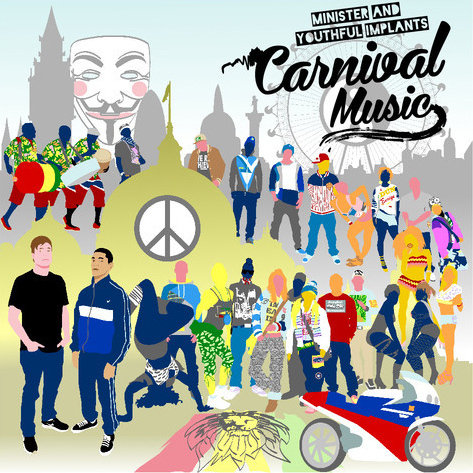 Rap aficionado and local hero Minister (AKA Scotty Hinds of Nine High and Smash Brothers fame) and producer extraordinaire Youthful Implants (Strontium Music and Supatronix) have come together to create the Carnival Music EP. The two artists, both independently established, met at a party in Melbourne, and quickly bonded over their love for grime and bassline music. After having exchanged a few ideas, Minister and Youthful Implants began work on Carnival Music. Fusing the high energy rhythms of dancehall and UK funky with a pulsing sub low bassline, the pair quickly laid down the first single “Google It‘’. An infectious tune that breaks down the easiest way to settle any debate or answer any question in this modern technological age… Guaranteed within 5 minutes of hearing this song you will answer any question you are asked with Google It followed by a chorus of laughter. Buoyed by positive reactions to this track, the other four songs on the EP became a real labour of love. All Out is an energetic ode to fitness and training, dedicated to the pursuit of reaching your peak performance as a human. Bang this joint while you work out in the gym for maximum results! Wanting to make a political statement as well as keep the dancefloor happy, Fun & Games addresses the scenario of police turning up to the party & trying to shut it down. Minister’s autobiographical lyrical style on the EP is both fun and hard hitting, with the musical styles on the EP appealing to both hip hop fans and dance music fans alike.